The broad political Left in the United States has been plagued for decades now with a culture of reaction, fragmentation, issue silo-ing, and a chasm between insiders and outsiders. Can the concepts of populism and hegemony help to explain these challenges? What insights might we gain through an exploration of these ideas? 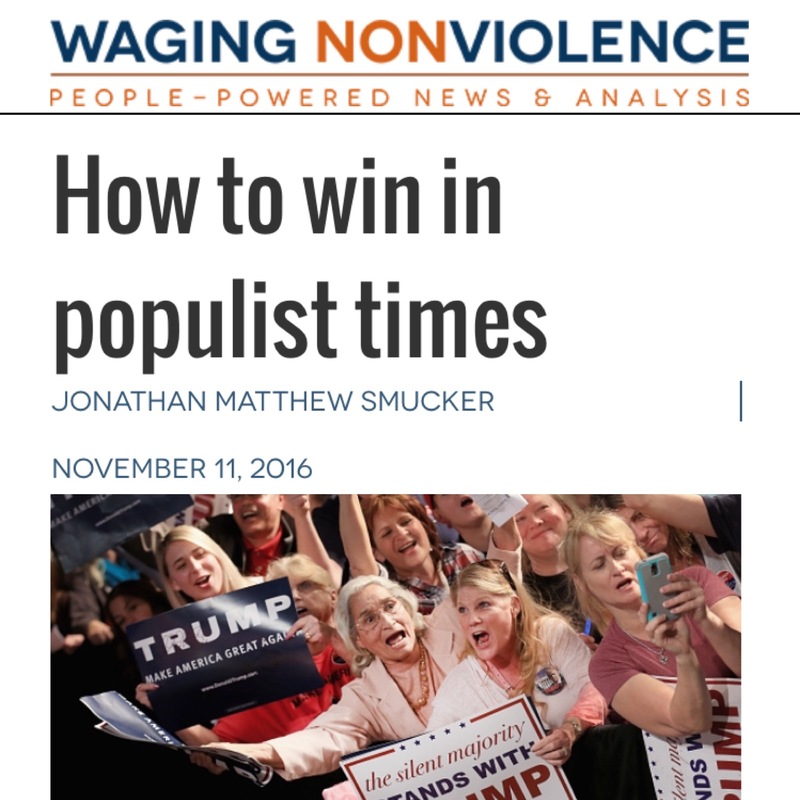 A series on populism and hegemony may sound nerdy, esoteric, and less-than-fully-practical for on-the-ground organizers, campaigners, and advocates for social justice (my intended audience), but I believe that understanding the patterns and processes of these two related concepts is key to effective long-term political struggle. In this series I’m digging in and attempting to work out some useful frameworks. I’m a student, not an expert, on these subjects &#151 and I’d love for other folks to weigh in on these ideas. Let’s say that I care a lot about the war in Iraq, and I start planning with some other folks in my town to put together a public rally to call for an end to the war and occupation. Well, what if we made the rally about the economy too? Everyone cares about the economy, right? Surely more people will come out if we link these two issues. Hey, while we’re at it, immigration is a big issue for a lot of people in our community, and I think we can get this one local immigrant rights organization onboard for our rally. We should at least be able to get someone to speak. And that makes sense. Immigrants are impacted by both the war and the economy. Also, there have been some folks working locally to stop a proposed waste incinerator. We should definitely have someone from that group speak at the rally. Wow, if we list all of these issues on one flyer, then we can attract a lot more people than the folks who would come out just because of the war or any one of the issues on its own. There are several important flaws to this kind of explicit connect-the-dots approach. It’s not that we shouldn’t be connecting the dots. And it’s not that we shouldn’t have strong moral narratives that can help people make sense of a platform of issues. But a strong moral narrative is different than just throwing a bunch of seemingly disparate issues onto the same flyer and assuming that we’ll be able to connect with anything other than an already highly politicized&#151and particularly politicized&#151audience (aka “the usual suspects”). What this kind of approach tends to do is to attract self-selecting individuals who come to the event as individuals. They may come as individuals from many different social backgrounds, with relationships to different social blocs. But these social blocs are not bought in, which means small numbers and few resources for the effort. Rallies are supposed to be demonstrations of grassroots organization and power (in order to leverage pressure to affect political change). But they can all too easily accomplish the opposite of this intention; they can be demonstrations of disorganization, powerlessness, and even incoherence (i.e. disconnection from any organized social base). As discussed briefly in part one, in modern society our identities are complex. Our lives tend to be fragmented. In different spheres of our lives, we play different roles, hold different loyalties, perform different identities, and cultivate different aspects of our identities. Take a minute to think of some of the many ways you identify or have identified throughout your life. What are some key aspects of your identity? Seriously, take a minute. If you want, grab a piece of paper and a pen and write them down. Welcome to the new BeyondtheChoir.org! This is an online space for grassroots change agents — folks who are engaged in grassroots organizing, campaigning, activism, advocacy, etc. — to share practical strategies, tactics and tools. It’s also a place to dig into deeper social change theory and to make it practical. There are lots of great websites that cover and critique the news. This site is more about engaging questions about how we can organize ourselves and strategically intervene. Comments: pretty straightforward. If you read an article that you have thoughts about, you can post a comment at the bottom of the article. You can also post a comment after another person’s comment. The option to post a comment will only appear when you are logged in. Quick Hits: A “quick hit” is a short blurb you write that briefly describes and links to a pertinent article that you’ve spotted somewhere else (on another site). The option to add a quick hit appears in the User Menu, after you’ve logged in. What kinds of articles should you post as user diaries? Well, there’s no hard and fast rule, but the general thread here is more how-to (as advice or as a genuine question) than news and views. There are lots of great sites that provide breaking updates and editorials on important progressive issues. We’re less about pointing out what the government or corporations are doing (or should be doing), and more about strategizing about how we, as progressive change agents, are going to make them do it. So, welcome to the new site! Feel free to post questions (or thoughts) in the comments section below. Cheers.